Pre-owned vehicle pricing includes all offers and incentives. Tax, Title and Tags not included in vehicle prices shown and must be paid by the purchaser. While great effort is made to ensure the accuracy of the information on this site, errors do occur so please verify information with a customer service rep. This is easily done by calling us at 877-750-9921 or by visiting us at the dealership. 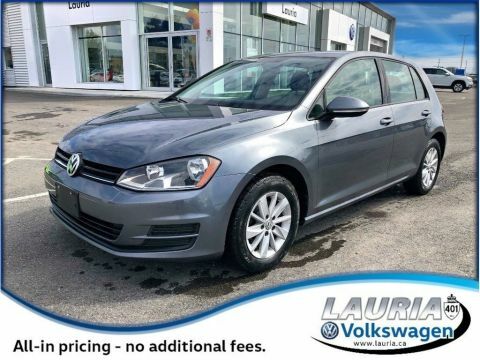 Fantastic value built into this 2017 Golf with only 37,306kms. Includes Heated seats, Bluetooth, backup camera, rear air & heat, power group, and much more! Fmr. Daily rental. No admin fees! Offered fully safety-certified, emission tested, and professionally detailed. Be sure to ask about the benefits of the Optional VW Certified Pre-Owned program including special financing rates as low as 0.9%, roadside assistance, rigorous 112-point inspection, 3-month of SiriusXM, and so much more. To qualify for CPO, vehicles need to be under 7 years old and pass very strict VW standards so you know you are only getting the highest quality pre-owned Volkswagen available. 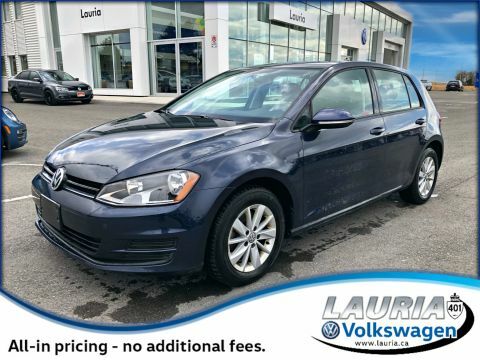 Lauria Volkswagen's Everyday Value Pricing Philosophy ensures we maintain our pre-owned inventory at, or below current market value at all times to offer our customers an easy, hassle-free experience every time. We may not always have the lowest price, but we will have a great value on every pre-owned vehicle we offer - ask us to prove it to you! Port Hope's Lauria Volkswagen is a family-run dealership serving Cobourg, Northumberland and the entire Central Ontario region from Oshawa to Peterborough to Belleville. Lauria VW is proud to combine our no-pressure, customer first philosophy with the fun and exciting vehicles you have come to expect from Volkswagen. Come visit our brand new, state of the art facility to see for yourself! The Lauria Auto Group, committed to total customer satisfaction since 1984. Welcome to the Family. We know you’re busy, and we know you do not want to waste time looking for your next vehicle. 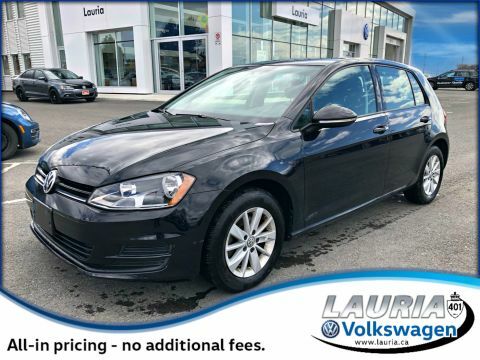 At Lauria Volkswagen we make the process simple and convenient by providing our all-inclusive price right form the start. Our prices always include everything but the taxes. We take pride in offering an exceptional product at the right price and look to provide ultimate transparency to our customers every step of the way. Come in today to experience a car buying process you can feel confident in. Lauria Volkswagen’s Everyday Value Pricing verifies our entire inventory is priced competitively in the market at all times. In order to guarantee our low pre-owned vehicle prices, Lauria Volkswagen has taken advantage of best in class software to track over 20,000 pre-owned websites. As you do your comparison shopping, you will see Lauria Volkswagen offers some of the best value in the market. We will provide a CARPROOF vehicle history report and explain how we arrived at our price. We may not be the lowest, but if you want to know who is, we will show you that too! No hassles, No games, at Lauria Volkswagen your vehicle purchase will be fast and easy and you’ll drive away with a great deal every time! 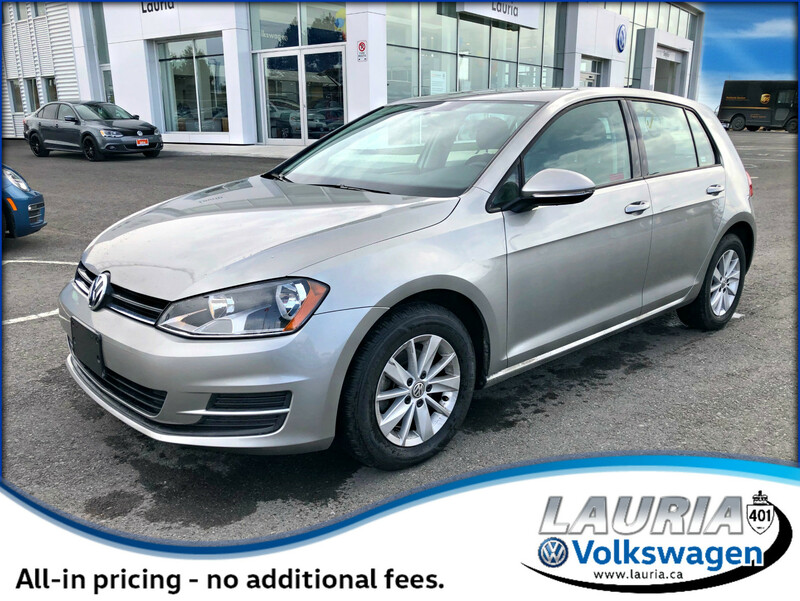 Lauria Volkswagen offers a wide selection of Certified Pre-Owned Volkswagen vehicles up to 7 years old with up to 160,000km, all carefully chosen in keeping with Volkswagen’s rigorous standards. To meet your needs, you can choose between two programs: the Volkswagen Assurance Program and the Volkswagen Assurance Premium Program. Both offer roadside assistance. In addition to a CarProof vehicle history report, complete reconditioning, and financing options, our certification includes a rigorous 112-point inspection, Volkswagen Plus Owner Privileges, and 3 months of free SiriusXM Satellite Radio.